Set in a small tranquil village in the midst of beautiful vineyards, sunflower fields and woodlands, this ex-residence of a French ambassador is only 5 minutes from supermarkets, restaurants, cafes and boulangeries. The village lies between Cognac the home of the famous brandy and Angouleme the region's capital. It is also only 5 minutes from Jarnac with its' bars restaurants and kayaking on the river Charente as well as being near to the wonderful west coast with its stunning beaches and famous seafood restaurants. The main house covers three floors and has 7 double bedrooms four of which have twin beds and all of which are decorated in individual styles. On the ground floor is a fully fitted kitchen, a breakfast room with antique tiled floor and a study and lavatory on one side of the hallway, whilst on the other side is a double sitting room with an original fireplace and TV and DVD. Above the kitchen is a fully equipped utility room with washing machine, sink and drying facilities. One wing of the house is a large dining area containing the original alembic used to distill cognac until recently. This also has its’ own kitchen with up to date fixtures and appliances including an American fridge with ice maker dishwasher and two ovens and hobs. The grounds are totally walled, providing total security for your children and complete privacy, comprising of a large cobbled courtyard entered by electronic gates, with a centrepiece fountain and covered parking. 2 hectares of parkland and a large pool which is 12 metres x 6 metres with an electronic cover. Additional activities: Activities abound in the area. From golf and kayaking to walks on the numerous paths through the vineyards and the towpaths along the Charente river. Why not visit the Museum of the Gabarriers to see the life of a Charente bargee. Close by is the market town of Rouillac which has a monthly market with reputedly the biggest livestock market in France. Outside Rouillac is a museum of the Roman occupation and the remains of a 5,000 seater roman theatre. For the more adventurous a visit to the Gironde peninsula is well worthwhile. Here you can visit the great winemaking Chateaus like Margaux and St Emilion or go sand yachting on the miles of beaches. Here among the dunes and pine forests, you can also see the old Second World War German fortifications, or if you prefer watching the world go by, there are plenty of small towns with cafes and restaurants serving fresh seafood. The Surrounding Area: The pretty town of Jarnac, the birthplace of Francois Mitterand 10 minutes away, sits on the banks of the River Charente where kayaks can be hired to explore the river and also enjoy the fishing. Jarnac is also home to the famous brandy house ‘Courvoisier’. 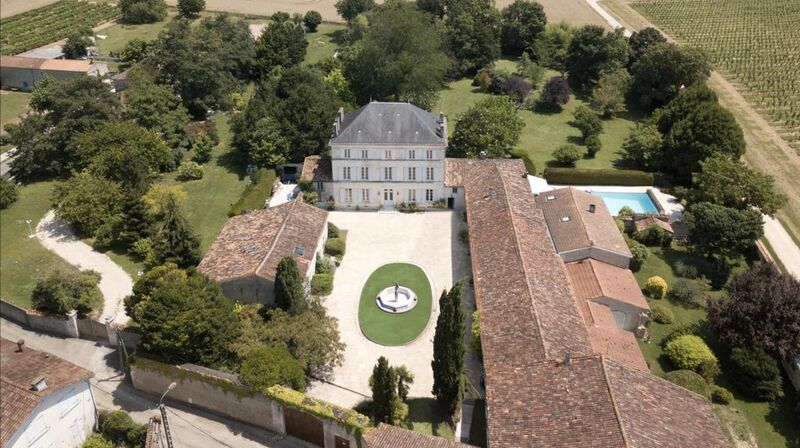 The ancient town of Cognac, home of ‘Hennessy’, ‘Martell’, and ‘Remy Martin’, is a 15-minute drive away. Most of the distilleries offer free tastings and tours. The beginning of March sees the 'Coup de Chauffe' festival, where street entertainers fill the streets with fun, and the beginning of July sees the streets taken over with Blues, Soul Music and Jazz bands with jam sessions between amateur and professional musicians. If you are here in September, there is the Rallye des Remparts in Angouleme where vintage cars race around the town. If you are tired of doing your own cooking, we can arrange meals in the house cooked for your group with of course accompanying wine. can be hired from an independent bicycle hire company. http://www.bikehiredirect.com/ or http://www.charentebikehire.com/ We have no association with either of these companies. A large 12 x 6 meter (144m3) pool surrounded by a security wall with a hard slatted protective cover for additional​child safety. Check-in time after 17.00 hrs and before 19.30 hours. Check out time before 10.00hrs. Numbers confined to 14 people including children over the age of 18 months. Any people over this number will be turned away. Bois de Vaux is situated in the Cognac area of France close to the river Charente, 15 minutes from Cognac itself and under an hour from the beach. It is close to the A10 motorway and also within an hours drive of airports at Bordeaux, La Rochelle and Poitiers all of which have cheap flights and car rental facilities.